The materials that constitute the sculpture are multiple, some of them often found in drones: aluminum, acrylic, a GPS locator. However, the unusual primary material used is more often found down below military drones, as an aftershock of their presence: human bones. MEMORIAL OVER GENERAL ATOMICS uses human radial bones, found in the arms of every person, as ‘the arms’ of the flying machine. The memorial completes a troubling circuit, becoming a drone re-embodied, a machine made of the aftermath of life. The below video is a document of the first flight of MEMORIAL OVER GENERAL ATOMICS, into airspace over General Atomics, based in San Diego, California, which manufactures some of the killer drones that are being deployed around the world. 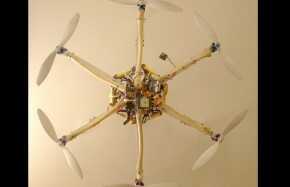 HEX-FLIGHT-1-LOOP from Alex Rivera on Vimeo. 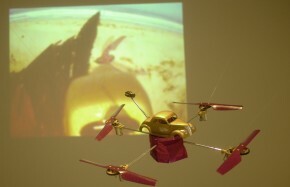 The LowDrone was commissioned for Insite2005 and first exhibited in the landmark show 'Drones at Home,' in the gallery at CalIT2, at the Univesity of California, San Diego.